This is the last of our Casual games predictions. To make sure you don’t miss all the following posts focusing on Mid-core, please do subscribe to the Deconstructor of Fun infrequent but powerful newsletter. Also, the other 2019 Predictions can be found here. Special thanks to Abhimanyu Kumar & Joel Julkunen for helping me co-write this one, and also Jussi Huittinen for, once again, crunching the numbers. AR-first games are not major F2P titles with minor AR features integrated, but games that have to be played in AR from the get go. These games are still at a very nascent stage. 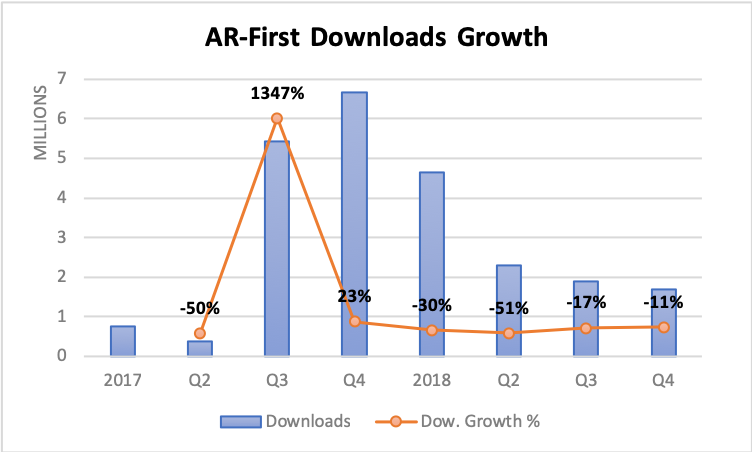 While there has been a major push by the platforms to showcase AR-first games in separate store sections, developers don’t seem to be taking a shot at AR-first as is showcased by the declining 2018 market trends below. The spikes in late 2017 were mainly driven by free to play titles “Stack AR” and “AR Dragon”, coinciding with the launch of Apple’s ARKit. The two major reasons for a declining 2018 is the low penetration of mobile devices that support AR technology and massive friction observed by potential customers to play AR-first mobile games while on the go. Further, a good chunk of AR-first games are paid, in turn throttling adoption growth. While 2019 will see an improvement in device penetration, the only thing we can say for now is that this space will not see any major movements until wearables (AR glasses for example) supporting AR-first games make a big splash amongst consumers. It has now been a solid two and a half years since the world got its hands onto the first true Location Based Game (LBG) and top grossing hit Pokemon Go, which had everyone up and about the streets chasing down Pikachus and Charizards. Clearly, the mix of a groundbreaking new genre, at least for everyone who missed Ingress, first mover advantage, a perfectly fitting IP and rabid virality proved to be a hit combination. There was plenty of talk about Pokemon Go merely being a fad that will soon fizzle out. But as 2018 came to a close, it was clear that this title isn’t going anywhere, as it had another great year behind it with a solid top-10 grossing performance. With the potential of this genre staring back, the market responded! Google decided to open up its Google Maps API to developers in March 2018, thereby allowing LBG developers to build LBGs on highly refined map data from the most widely used maps app in the world. This proved to be huge and new LBG market entrants fully utilised the opportunity, leading to some significant launches in 2018 - including Ludia’s “Jurassic World Alive”, Next Games’ “The Walking Dead (TWD): Our World” and FourThirtyThree’s “Ghostbusters World”. Shipyard Games (Supercell backed LBG studio) also soft-launched “GoCity” (a 4X-ish LBG), while there are rumours of Blizzard working on a LBG too! All this market action resulted in massive Quarter-over-Quarter (QoQ) growth spikes on both the downloads and revenue sides of the market, with Q2 and Q3 2018 being the highest growth quarters. While these new launches contributed significant Quarter-over-Quarter (QoQ) downloads and revenue growth, the uptrend was not sustained into Q4. As can be seen in the market share graphs below, none of the new launches were able to sustain the dent they made into Niantic’s market supremacy (84% download share, 92% revenue share!). “Jurassic World Alive” had a notable downloads spike in its first couple of months (even surpassing Pokemon Go briefly), but that evened out rather quickly. And the numbers story is similar for both “TWD: Our World” and “Ghostbusters World”. It should also be mentioned that Pokemon Go saw a positive rub off on its numbers due to the launch of “Pokemon Quest” by The Pokemon Company during Q2 2018 - therefore contributing to overall sub-genre growth. We don’t want to understate the great live-op activities Niantic has been performing though. Why have other LBGs not seen Pokemon Go’s success? “TWD: Our World” focussed on rescuing survivors from zombie hordes while collecting supplies and weapons. Though it was reported that the game suffered from major technical difficulties during its first launch months, which naturally had a negative impact on the game’s overall performance. 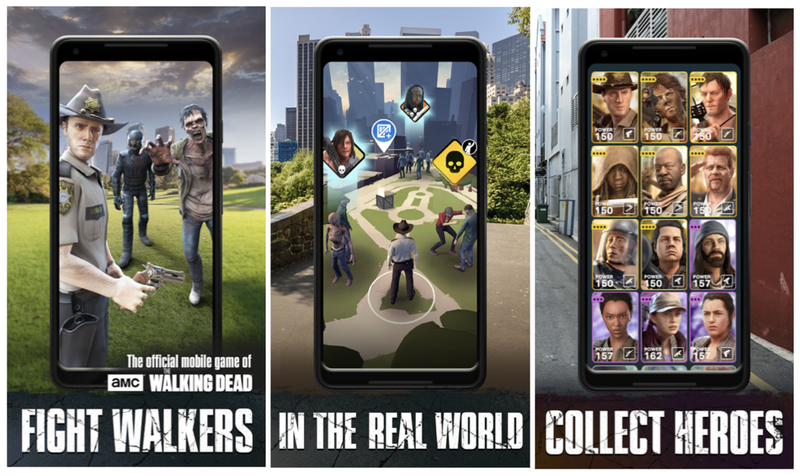 Moreover, one could argue that the Walking Dead IP doesn’t quite support highly addictive and vast collection mechanics as is the case with Pokemon Go. And well the demographic appeal of the TWD IP leans more towards the adult audience, which would further chop its legs of widespread success. On the other hand, “Jurassic World Alive” saw a smooth technical launch, packed a well known IP that is popular across ages, showcased real world dinosaur hunting, breeding and even a full-blown PvP mode with a ladder system. “Ghostbusters World” too featured expanded game systems with real world captured ghosts being used as a team in a turn based PvP battler. All very engaging gameplay designs, high quality products and fitting IPs, but still not powerful enough to overthrow Pokemon Go. Could we have seen this coming? Walking Dead: Our World was a major disappointment to Next Games that put the company into a downward spiral. While technical difficulties were for sure an issue, one could argue that the Walking Dead IP doesn’t quite support highly addictive and vast collection mechanics as is the case with Pokemon Go. There are a couple of interesting macro data points that could correlate with Pokemon Go succeeding where everyone else seems to have failed. And maybe studying these gives us a peek into what's to come in 2019. First - In terms of estimated franchise value and therefore scale/reach, Pokemon is by far the leader of the lot - not to mention that Pokemon is arguably one of the most valuable media franchises in the world. Surprisingly enough, the various franchise values follow a similar trend to the December 2018 downloads share of their respective LBGs, as can be seen in the graph below. Secondly - Google search interest for Pokemon is way higher across the world compared to any of the other IPs. Another strong indicator of the huge reach of the Pokemon IP, and probably a more globally recognised one than the rest. The more even interest spread is directionally confirmed with Pokemon Go seeing healthier distribution of downloads across the world (only 16% downloads coming from US) compared to the other IPs that are more skewed towards the US. On the revenue side of things, Pokemon Go rakes in only a little above 30% of its revenues from US, while Japan brings in another 30% and the remaining 40% is driven by the rest of the world. The other LBGs see half of their revenues coming in from US. When looking at the 2018 data, it can be seen that LBGs as a whole have reached a point of maturity and without radical changes, the market will develop around the same pace during 2019 with Pokemon Go as the clear king of the genre. However, Niantic’s upcoming LBG “Harry Potter: Wizards Unite” could radically shake the status quo when it’ll be released during 2019. The Harry Potter IP is as big as they come (see “Franchise Value” graph above), it is well known across the globe (see Google search trends graph above), but it remains to be seen how solid a game Wizards Unite will be in terms of structure and feature composition. Though all the indicative data above and Niantic’s immense knowledge about the space seems to point to they have their next hit bubbling under. One big question we all have is what will be the source of Harry Potter’s player base, given the high demographic overlap with Pokemon Go. Will it end up drawing players away from Pokemon Go and thus cannibalizing its market share or will it be able to attract new players to the genre and increase the total size of the market? There have also been talks about “Pokemon Go” getting released in China in 2018, but that did not happen. It remains to be seen if the market would open up for LBGs and Pokemon could get its China release during 2019, which could strengthen the game’s market share even further. Although it is hard to predict how well the game would do in China, it is clear that even breaking into the top grossing 200 would bring significant revenue due to the size of the China market.